Luxury Villa just 2 minutes walk from the beach, located in Marina di Arbus more commonly known in Sardinian 'Gutturu de Flumini' in the Costa Verde and 15 minutes from the largest sand dunes in Europe called Piscinas. The villa consists of 3 floors of which the third fully equipped terrace of 90 square meters from which you can enjoy the fantastic sunsets. On the first floor with about 120sqm of interior there is a huge living room and sitting room with a large table for over 12 people, 1 double bedroom, 1 bathroom with shower and toilet, 1 kitchen equipped with all comforts and 200m² of outdoor Terrace and equipped and partially covered garden surrounded by a beautiful garden with plants, trees and Mediterranean vegetation. On the second floor with an independent entrance with a small door we find a space of about 100sqm, divided into living room with table for 6 people and exit to the terrace with sea view, Corridor leading to: a kitchen with 4 burners full of everything, 1 bedroom double bed with fireplace, 1 bedroom with 1 bunk bed and 1 double bed, 1 bathroom with shower and toilet. At the entrance of the Villa there is a further outdoor shower. The Villa also has an internal parking that can hold up to 4 cars. La villa est encore plus belle que sur les photos et la vue des différentes terrasses est magique. On peut rester des heures à contempler la mer. Nous avons adoré la terrasse avec l'espace repas où tout est fait pour passer d'excellent moment en famille. La villa est soignée et décorée avec beaucoup de goût. Les chambres sont magnifique et très confortables . Bref, un merveilleux séjour dans une villa SPLENDIDE ! What a beautiful place !! We (family with four children from Switzerland) enjoyed our stay very much: You can walk to the beach in only 2 minutes. With the car you can reach many other very beautiful beaches in 10/15 minutes. 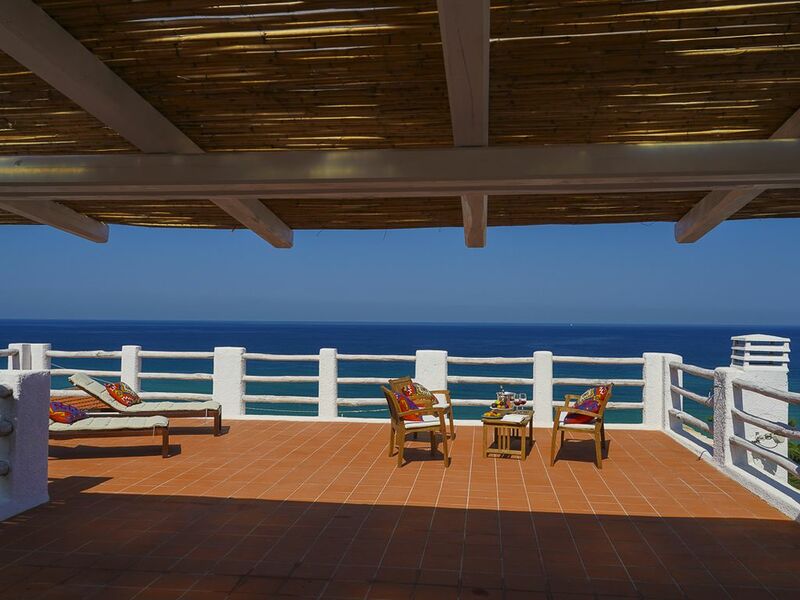 The Villa has wonderful seeview, it is quiet and spacious and has everything you need for daily life. The owners are very helpful and friendly. Most of the beaches are quiet and you can enjoy this beautiful nature. We could not ask for more, we loved this place. We enjoyed our stay in this wonderful Villa very much. The Villa is as nice as shown on the pictures, iven more on reality. Our family- four adults and two children- fitted perfectly in this Villa. From the terrace you have a beautiful view to the sea. It was amazing waking up and having coffee looking this stunning view. The owner was very kind and helpful. Hopefully we will come back very soon. It was a five star vacation. Una location fantastica; posizione invidiabile, dotata di ogni comfort, elegante e ben curata con gran gusto, con la massima attenzione per gli ospiti. La veranda ha un panorama mozzafiato, che invita a rimanere seduti nell'ammirarlo per ore senza mai stancarsi. La vacanza è stata meravigliosa, è una Villa da consigliare in maniera assoluta; la stessa spiaggia di Marina di Arbus è una delle migliori nella Costa, non essendo soffocata come le altre da un turismo asfissiante. Un grazie particolare anche ai proprietari, mai privi di ottimi consigli per rendere la permanenza estremamente piacevole. This amazing Villa is huge and spotlessly clean with large well-proportioned rooms, you are not bumping into one another, great bedrooms, bathrooms and showers. The perfect place if you are Travelling with children and grandparents or big group and you are looking for peace and quiet with stunning views. There was plenty of outdoor space with huge equipped terrace and a nice barbecue area. The beach was beautifull and at just few steps away, I have never seen such crystal clear water. The owner thought about every single detail to make our stay as pleasant as possible. We didn't venture to far from the Villa as we found we had everything there for a peaceful and relaxing holiday. I would certainly book this Villa again.